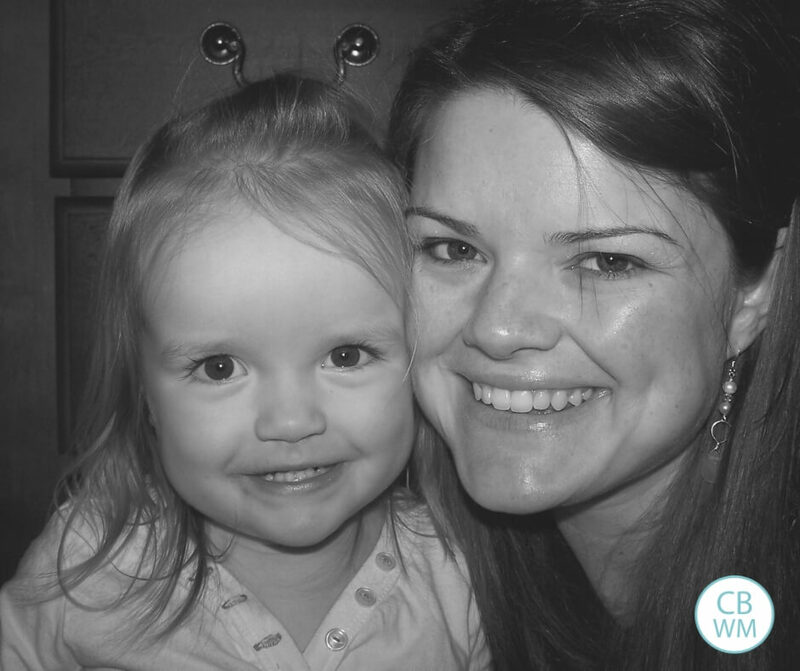 Read for a full rundown of a child switching to a toddler bed. How to handle the child getting out and what expectations are reasonable. A little over a week ago, we moved Kaitlyn to a toddler bed. I wasn’t really sure how it would go overall. In most ways, Kaitlyn has been easier than Brayden was overall, especially with ‘babyhood.’ When it comes to discipline, I am not sure who is easier. Brayden tested limits earlier and tested limits more often, but he was overall more obedient just for the sake of being obedient. He is a rule follower by nature. Kaitlyn doesn’t test limits often and started testing them at a much later age than average, but I am not really sure what her motivation is for following rules. Brayden is like me in that respect, so I totally get him. For her, I am not sure what it is. As she has with discipline issues, Kaitlyn went through her “rebellious stage” later than most kids. Around 18 months old, most toddlers seem to really test their limits in a big way. Kaitlyn waited until she was 21 months old to do this. So we were sure to wait until that was over before we moved her over to a toddler bed. We then had issues with her toddler bed being broken when we opened the box, so we had to wait for replacement (by the way, Jardine Enterprises was awesome with this. They sent us the replacement part right away with no questions asked and all for free. Fisher-Price is the same way with their stuff). With these two factors, she was moved a little later than I would have liked. I like there to be more time before a new baby to work through any kinks, but it has worked out okay. In most ways, Kaitlyn was really good. I wasn’t sure what to expect from her. She has always been the type to not so much as sit up after you lay her down for bed. She also loves to sleep, so I knew we had that in our favor, but you never know what the new opportunity of freedom will do. Kaitlyn loved her new bed and was not sad to see the crib go in the least. When we put her down for naps and at night, she went right to sleep with no problem and slept her normal times. When moving my children to big beds, I haven’t ever stressed that they need to stay in bed. I don’t really want to put it in their heads that it is even an option to get out of bed. I worry that if I say, “You need to stay in your bed” they will think, “Wait…you can get out of your bed!! !” They always stayed in the crib, so why would the bed be any different? With Brayden, this was never a problem until he started potty training. At that point, I had to tell him he could get out of bed to use the potty if needed. A look of interest crossed his face and he spent much time figuring out if there were any other acceptable scenarios for getting out of bed (see Toddler/Child Getting Out of Bed), but this problem has since been solved. With Kaitlyn, I didn’t tell her to stay in bed either. As I said, she went to sleep great. After her nap was over, she would wake up, get out of bed, get a toy or book, and go back into her bed. Ideally, I think you should rush in the moment your child wakes to praise them for doing a great job. The problem is Kaitlyn is really, really quiet when she wakes up. You don’t know if she is awake or not. So I walked into her room to find her with some books on her bed that were across her room before the nap started. I told her she needed to stay in her bed. She didn’t really understand what I was saying and thought I was telling her it was still time for a nap, so she put her head back down to go to sleep. The next day, I did catch her as soon as she woke up and before she got out of bed. I praised her for staying in bed, but she still wasn’t understanding exactly what I was trying to communicate to her. The next day I had my husband go get her up because I was sure she was still asleep. He found her out of bed gathering her toys. Several nights after moving to her new bed, I woke at 3 AM to the sound of footsteps (I am a really light sleeper). I then heard little clinking noises. I looked at Kaitlyn’s monitor and saw the lights on the monitor moving, telling me the sounds was coming from her room. My husband went to her room to find her in bed playing with her Legos (currently her absolute favorite toy). He told her it was time to sleep, took her Legos, hid them, and left the room. He came down and told me he hid the Legos. He must have forgotten in his sleepy state that Kaitlyn misses nothing. Sure enough, a minute later we heard the clinking of the Legos again. He went up and as soon as he walked in, she handed over her Legos. This time he took them out of the room ;). I found this situation odd (and admittedly quite funny). We never had this issue with Brayden, and he doesn’t like to sleep. The next day, I found that she had her final canine tooth coming in. These have been painful for her, so I assumed the pain was making it hard for her to sleep. So before bed, we gave her Tylenol. She slept just fine that night. My husband started to tell her to stay in her bed when he put her down for bed or a nap. Telling her at the beginning of the nap rather than after the nap seems to have communicated what we were trying to tell her. She now waits until I go in to get out of bed. As soon as I walk in, she sits up and slides out of bed. I give her lots of praise and kisses for being such a good girl and staying in her bed until Mommy gets there. What was the solution to her getting out of bed? One was helping her to understand the expectations we had. That was most of the battle. We explained the problem when she was out of bed early. We explained what we expected. Finally, we explained expectations before the problem happened. This was the most beneficial for her. We were then able to praise her and tell her all she had done right, which makes her happy and want to repeat the correct action. Another part of the solution was simply time and consistency. After several days of repeating expectations and being consistent about what was okay and what wasn’t, she was doing what we wanted. We never had to use any sort of punishment at all. She hadn’t been properly trained in the right way yet. If she starts getting out of bed again in a year (similar to Brayden), that is when we would evaluate what form of punishment would be appropriate. For now, her stage of discipline is simply to lead her in the right way. Some people might wonder why I cared about her getting out of bed at all once the nap was over. It is true that the highest priority is for the child to stay in bed and sleep. Once the nap is over, I can see parents deciding it is no problem if he gets out of bed to play, especially in a situation like Kaitlyn’s where she was getting out of bed, getting something she wanted, and getting back into bed. I think the issue goes back to the funnel. This is not a freedom an 18-24 month old is equipped to handle yet. At this age, most children are still in great need for the nap, so going to sleep right away might not be a problem. Then you end up with a grumpy, tired child. If the rule is to stay in bed, the child is more likely to drift into the next sleep cycle than to wake up to play with toys. There will come a day that I will allow Kaitlyn to get out of bed after a nap on her own. Brayden does. But that is a freedom to earn. The child must demonstrate an ability to handle that freedom. For now, she will stay in bed and wait for me to come get her. Just wondering if you have any tips on siblings transitioning to sharing a room? I have a nearly-3-year-old daughter and 17 month old son who will be sharing a room in just a couple months as we prepare for a new baby! They have similar sleep schedules, although I do plan on napping them separately. Do you have any posts that might be helpful to me? Hi! I left a question on the post “The More You Do It, The More Your Child Will Get Used To It”. If you haven’t had time to respond sorry in advance for bugging you again. I just wanted to make sure you got an email about it. *to add to my question. She sleeps in her crib so I don’t know why she’s laying on the floor and she’s still doing it 6 days later??? Hello, my son is 32 months old and we havent transitioned to a bed yet because we are trying to sell our home and hoping to have a larger bedroom for him to accommodate twin or full size instead of buying a toddler bed now. (If we do not move in the next 6 months we will buy a toddler bed.) Is this too late to transition? Are we pushing the envelope here?We’ve never had a problem with him climbing out of the crib at all, which is great – actually Ive found him once or twice moving his bathroom step stool and climbing INTO the crib during roomtime recently. My main concern is him getting out of bed when we do move forward with the transition. I think we have obedience to instructions the FIRST time only about 50% of the time – he is sanguine and just doesnt take things seriously. He is very articulate for his age and understands all our commands so Im concerned that he will see the bed transition as opportunity for freedom, and Im wondering how I would handle it at nap time if he gets up without asking to get toys, etc. There are some days where it takes him 45 min to fall asleep at naptime and I think he would be tempted to get up and play. Yesterday he didnt sleep at all but talked to himself for 2 hours, which happens maybe once a week. I know he would not stay in bed on a day like that. Any advice?Based on your experience with Kaitlyn, would you recommend setting the expectation up front that he not get out of the bed until I come in his room (other than to sit on poddy) or else there will be a specific punishment? Im more worried about naps than nighttime sleep, although at night he is also prone to talking to himself sometimes for 40+ minutes before falling asleep. That could be another time when he would get up, to get water, go into his bathroom to fool around, etc.BTW his typical daytime nap is 2 hours long (2-4 PM) and his nighttime sleep is approx 830 PM (or 9-930 by the time he falls asleep) to 730 AM. thanks! I have a 15 month old girl and we are expecting a little boy in 5 months. My daughter will be 20 months when the new baby is born. I’m trying to decide when to transition to the toddler bed. Would you do it soon within the next month or two in order to allow time for the transition before the new baby arrives or would you wait until after the new baby arrives and that transition has worked itself out. I’m also up against another transition of our family possibly moving in two months. 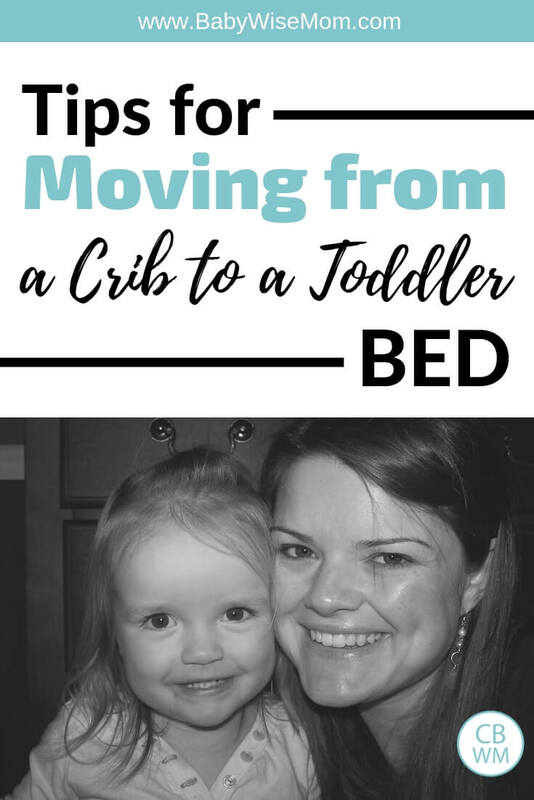 Do you think it would be a bad idea to tansition to a toddler bed when/if we move into a new house in 2 months all at once and then the new baby will be born 2 months later, or do you think I should just keep things as they are and have 2 in cribs until things settle down? This means I would have to buy a new crib that wont be getting used again as this is our last child. Thanks for your advice- Tina. This was very timely for our family. My son is 19 mo and we are planning on moving him into the toddler bed as soon as the toddler bedding arrives (in a couple of weeks). I really liked what you said about consistency in training them to stay in the bed and not punishing for getting out of the bed. I also agree your reasoning for not letting Kaitlyn get of the bed until you come in there b/c it is too much freedom at this age. Thanks for sharing your knowledge! Hi, I am expecting my second child in July and my son is 14 months old right now. We are wanting to get him in a twin size bed before the new baby gets here. He will be 18 1/2 months old when she is born. My question is, do you think it is reasonable to think he will transition into a “big boy bed” at that age. I was even thinking about starting the transition when he’s 17 months old to get it going before the new baby arrives. Also, I can’t imagine him comprehending if I told him to “stay in your bed” or “call out to mommy if you want to get out of bed” I guess I am just wondering if I have unrealistic expectations with this! Thank you in advance! Noelle,I don’t have any experience with it. I had decided to not have Brayden and Kaitlyn share because they laugh and giggle “too much” when they are together, so I didn’t think sleep would really come. At this point, I think they could share a room, but we have everything all set up separately.I think it is very wise to nap them separately.For night, try to figure out if it would be better to have one go to bed before the other or have them go to bed at the same time. I think if mine were to share, I would have Kaitlyn go to bed about 30 minutes earlier. Brayden is really good about respecting others while asleep, and that way there would be less chance they would sit and talk to each other instead of go to sleep.Before you move them together, be sure they are both good about staying in bed since having a playmate in there with them will be quite the temptation for getting out of bed. Good luck! If you find any good tips as yo do it, let us know! I know, Christie, it really was so funny. Tina,I don’t think you need any more than a month before the new baby is born to work through the transition. We have only had it for 2.5 weeks and things are really smooth by this point. You will have to decide what you think about transitioning/moving at the same time. Some children would need the same bed to help transition while others would thrive with the changes at once. Like I said, one month should be enough time to get things smoothed out. Spacify.com has one of the largest selections of Kids Beds on the web so check it out. Tracy, did you ask this somewhere else? I remember aswering this in a different spot a couple of days ago? Hey there…I posted a question here before a few months back and now have a new question regarding this same topic. My son is now 27 months old and is still sleeping in his crib. The past 2 months, naps have been horrible. He's never been a really great napper. He doesn't want to sleep b/c he just wants to play. I would put him in his bed and usually he would just talk or sing until he finally fell asleep. The last two months, he screams and kicks the wall through the crib slats and does this the whole time he's in his crib. My question is, do you think the crib could be causing a problem b/c he's old enough now to be in a bed? Could it be hindering his sleep? It seems like a long shot for me, but I've been trying to think of anything that could be causing it. He sleeps beautifully in his crib at night but nap times are horrible! Do you think it's time to put him in a big boy bed? I'm nervous about switching him b/c I don't know how he will handle it when he isn't napping in his crib anymore. Any suggestion would be greatly appreciated! Thank you! FloridaMom,I would agree with Kristin. I don't think he really knows that there is the big bed option right now. He is young and he has always slept in a crib. I think if you moved him out right now, he might have major problems.There is a post called "2 year old sleep problems". You can either type that in to the google search bar at the top right of any page (on the blog) or you can go to the blog index and look under the "sleep problems" index. It is listed under the section "by age"
It's been a while since looking at your blog and catching up on my babywise skills! My little boy is almost 2 1/2 and he is still in a crib. He was a babywise baby, still takes a 1 1/2 nap everyday, and very well mannered (for the most part). However, A few nights ago he finally figured out how to get out of his crib! So we ended up having a horrible night with him trying to sleep in a twin bed we have. It turned out to be a bad experience, so bad he has preferred to go back to his crib and hasn't tried to jump out again. We are moving in 2 weeks and have decided we are not setting up the crib again and he is moving to a "big boy" bed, or twin bed. He has always been a good sleeper. Goes to bed alone, we have a good routine, it's so easy! But when I tried to have him sleep in a twin that night, it was almost as though he had separation anxiety. He wouldn't let me leave without jumping out of bed and crying. The only way he'd sleep was if I was next to him. When he did fall asleep within an hour he'd end up in our bedroom waking us up. How do I deal with this "separation anxiety" when he moves to a twin again? Do I lock the door and let him cry it out? I've never had to worry about him getting out of bed by himself, so i'm a little lost. Thanks for your help. Also, he's started to become an early waker (before 6am) we've darkened the windows and it hasn't helped. He usually sleeps from 7:30 pm-7:30am. What happens when he is in a twin bed? I'm starting to worry it will be even earlier! Your blog has helped me so much in the past, I hope you can help me again! Hi Sophie, Ive been on this specific blog before. My son is now 6 and my daughter just turned 3. We have not yet moved her to a big bed, although we are preparing to in the next few months. My son stayed in his crib until he was 3.5 yrs old and it was just fine. I would encourage you to keep your son in a crib or pack & play (if you dont want to set up the crib in the new home) until he can demonstrate self control to stay in bed and go to sleep quietly like he would before. If he is mature enough to understnad (like potty training) that this is a milestone for a big boy, and he can make the decision to behave appropriately and stay in bed calmly, then he is ready. If he cannot – cries, gets out of bed or crawls out of crib, put him back in his crib or pack +play and wait a few more months. The same goes for moving from a high chair to a booster seat at the table. Maturity and readiness are shown when child can obey mom. I think this will serve you well! I know its inconvenient, but the long term goal and training is more important.